If you’re like me, you have not only many pairs of shoes in your closet, but also many bags—tote bags, wallets, clutches, shoulder bags, messenger bags, organizer bags. The list is endless. If you sew, you can save a few dollars by making your own customized bag. Don’t have time to generate your own pattern? There are many PDF patterns you can download from Etsy. If you would like to sell finished items from these patterns, please check the policies of the designer. Some designers will allow you to sell online, others give you permission to sell at craft shows only, and others limit the number of bags you can sell each year. In no case are you allowed to mass produce the bags, or to sell the patterns themselves. The assumption is that you are making the bags cottage industry-style, using your home sewing machine. 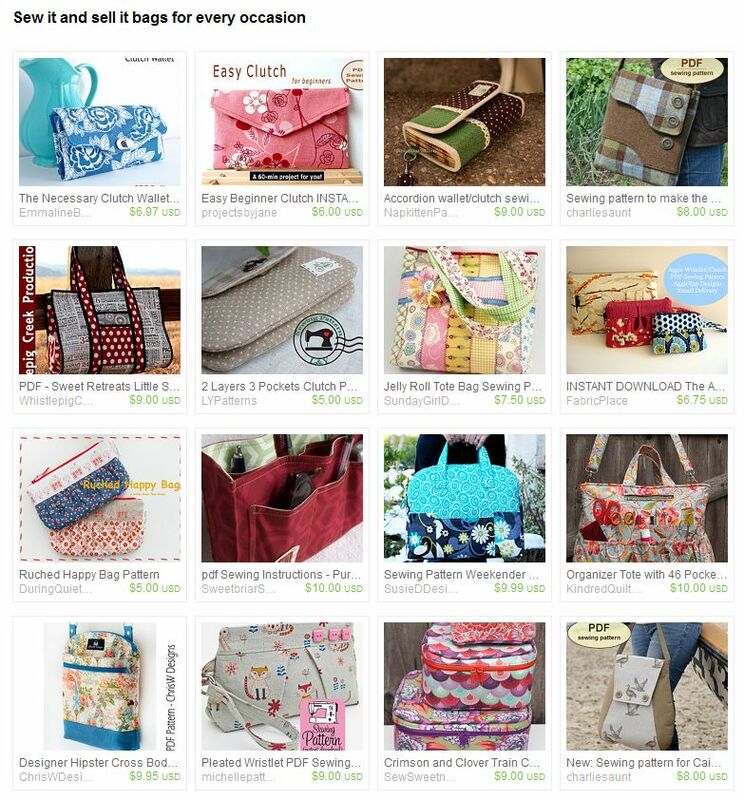 Feel free to click on the image below to look more closely at these wonderful bag patterns. Many of the designers offer additional selections in their shop. Great patterns!! Love the Emmaline clutch! 46 pockets!! Oh, my! It’s so great that there are patterns out there that allow you to make a sell the items. Great list here! Great idea for a treasury! Love the range of options here. There are some nice looking bags here! Too bad I don’t have my sewing machine this summer. Thank you for including my Ruched Happy Bag! What a great group of good looking bags! almost makes me want to get out my sewing machine!